Hey guys just found this site when googling something for my car, seems like a really good Civic site. I'm originally from Brampton/Mississauga. 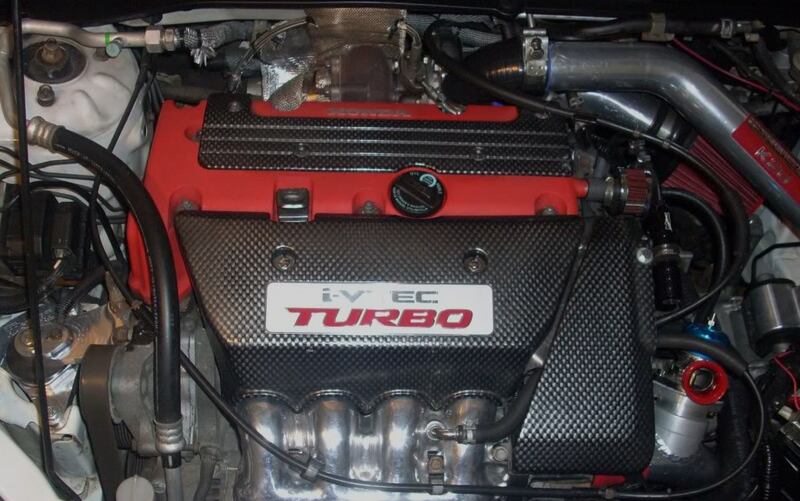 My money pit is a Turbo'd 2002 Civic SiR with a TSX K24a2. I bought it stock in 03 and been sinking cash into it every winter since then. My winter beaters are a 1999 4dr Civic for me and a 2005 Civic Se for the wife. 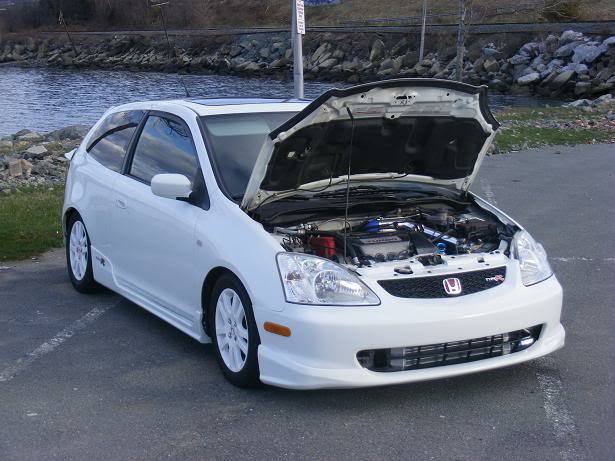 Well guys/girls glad I found the site, always nice to find a great source of information for Honda's/Civic's. Sounds like a very interesting and unique project... POST PICS!!!! welcome to TCC, there is plenty of information here, and many knowledgeable people that are always welling to help. Welcome to TCC, enjoy the forum. Oh man... paint the intercooler flat black and you'd have quite the sleeper! hehe. Have you dyno'd it yet? It is a bit of a sleeper with those wheels on it but I usually run red wheels with a polished lip in the summers, so unfortunatly it gets alot of attention. I won't be able to Dyno it with the K24 until spring. 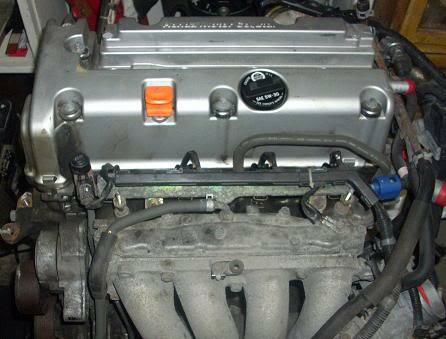 I had the stock k20a3 in it last summer but mishifted at the track and screwed that motor. So I have been working on the new setup for the last few months, waiting for spring so I can street tune it first then get in for some dyno tuning to get the most out of it this year. sick looking car and setup. Very nice car! Hope you can come out to our weekly meets. Welcome to the show. When you're up to dyno, speak to our vendors, HiVelocity is an expert in that field. Welcome! !very nice ep3,dont change anything unless you get the mugen kit . 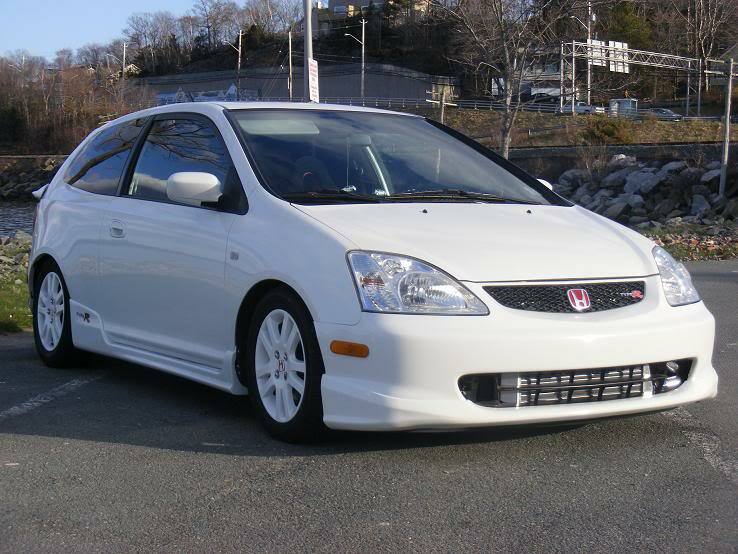 possibly my next honda after my coupe. Thanks again, no I won't be changing anything on the exterior or interior now I like the clean semi sleeper look. Just working on detailing the K24 and smoothing out the engine bay and tucking the wires. 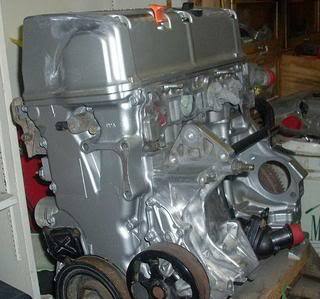 Lately I have been polishing all the aluminum parts on the motor like the pulleys, brackets, water pump, intake just about anything that is aluminum. 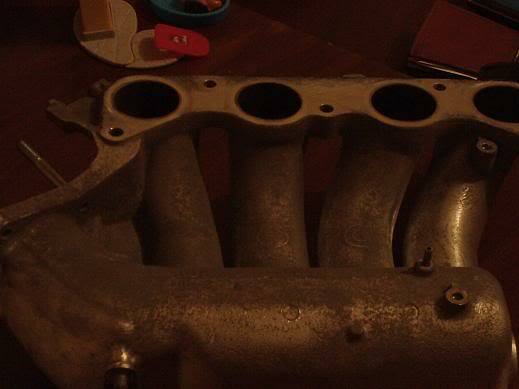 Hoping to be able to get the motor assembled on the stand this weekend. 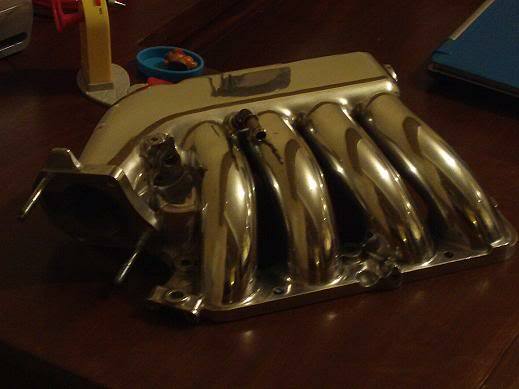 Here's a few pics of my intake I just finished lastnight. 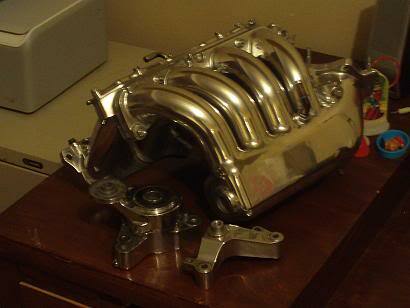 I'm working on a crazy valve cover right now, I'll post up some pics when I get a little more done on it. That looks sick man! Nice job! Awesome job on the intake mani. What did you use? I used 220 grit wet/dry sandpaper to get off the corrosion, casting lines and texture then worked my through wet sanding with 500, 800, 1000, 1500, 2000, 2500 grit paper then just alot of polishing using autosol. 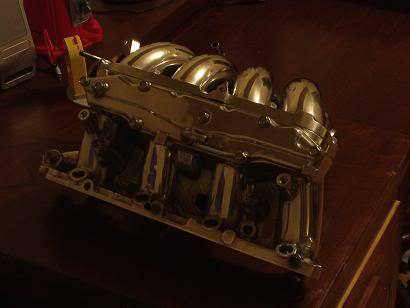 It was alot of work I think I have about 25 hours into that piece, but its only one half of the k24a2 manifold. I'm working on the second piece right now. Its alot of work but I think it will be worth it in the end. So I got a chance to work on the car a bit more the last few days, Finished cleaning the motor, painted the block and timing chain cover, polished head, polished (ing) the water pump. I also finished the other half of my manifold, tensioner pulley and idler pulley bracket. 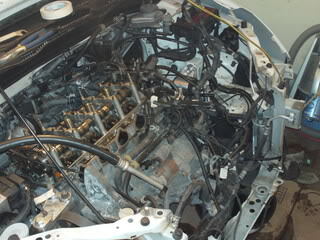 I did a bit more work under the hood getting everything stripped out that is in the way of the motor coming out. Now all I need to do is pull the mounts and the old motor can come out. 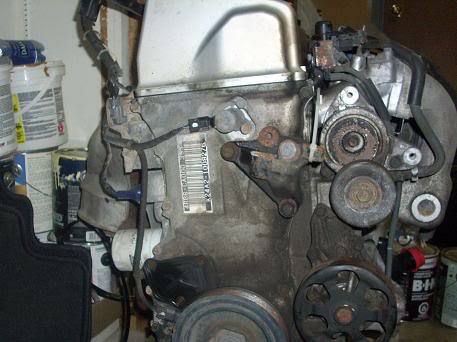 The motor the day I got it. 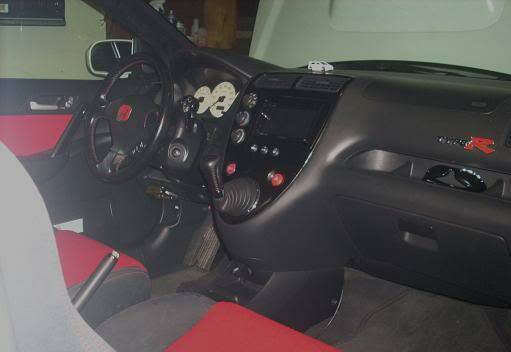 And finally a pic of how the car sits now......so much work to do!!! !